Situated on the southeastern part of Kyushu and surrounded by mountains on three sides, Miyazaki prefecture enjoys the warmest climates of the main islands of Japan. 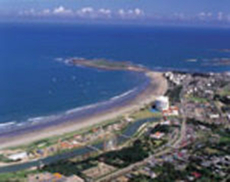 Along the coast from Miyazaki City is the beautiful and very popular Aoshima Island. The island has a surface area of just 4.4 hectares and is linked to the mainland by a bridge. From Aoshima train station the island takes five minutes on foot to reach. In the centre of the island is the Aoshima Shrine and a beautiful statue of Benzaiten, one of the Sea of Hyuga’s seven lucky deities. 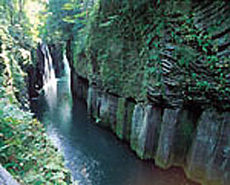 In the most northern part of Miyazaki is the town of Takachiho which is steeped in Japanese Mythology. It is the supposed site of the legend where Amaterasa, the Shinto Sun Goddess, disturbed by her cruel brother’s pranks hid herself in a cave, prompting other gods and goddesses to try to lure her out. There is a beautiful waterfall above the caves and a 1 kilometre nature trail. The gorge was formed over 120,000 years ago as a result of volcanic eruptions. To the east of Miyazaki city along the coast lies the picturesque town of Takaoka with its beautiful park and many wonderful hot springs. 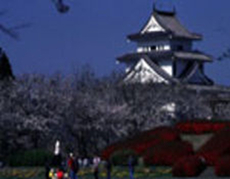 In the centre of the park is the Amagajo Castle which houses the Amagajo Museum of History & Folklore. 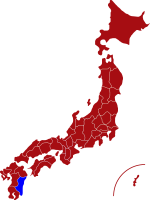 For more information about Miyazaki prefecture, see their official tourism website. Air - Miyazaki Airport operates daily domestic flights from/to Fukuoka, Osaka, Nagoya and Tokyo. The flight time from Tokyo is 1 hour and 30 minutes. Click here for its website(Japanese only). 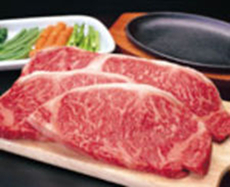 Miyazaki Beef - The brand name “Miyazaki Beef” is only awarded to selected beef that reach very stringent criteria, including tenderness, texture and colour. Its succulent and unique taste has gained it a high reputation worldwide. Takachiho Waterfall is an impressive V-shaped gorge that is best seen from the river. The view from a boat directly up the 17-metre Manai Falls is truly stunning. Amagajo literally means 'the castle in the heaven', built on top of a hill it and was one of the eastern defence lines of the Shimazu samurai clan of Satsuma. Aoshima is a beautiful island with a total surface area of just over four hectares. The island is linked to the mainland by a bridge which can only be crossed on foot.